KRZESINY AIR BASE, Poland—A Russian fighter jet last week intercepted a formation of 11 NATO aircraft, including U.S. bombers, as they flew within international airspace over the Baltic Sea as part of a military exercise. 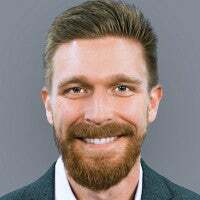 This correspondent for The Daily Signal was onboard a U.S. Air Force KC-135 aerial refueling tanker, part of the formation June 9, and witnessed the intercept by the Russian Su-27 fighter jet. On this day, NATO warplanes join for an extraordinary aerial formation, comprising two U.S. Air Force B-1B bombers, one USAF B-52H bomber, two German Eurofighter Typhoon fighters, two Polish F-16 fighters, two U.S. Air Force F-16s, and a U.S. Navy P-8 surveillance aircraft. The aerial refueling tanker, which flies in front of and above the rest of the formation, carries The Daily Signal’s correspondent and other members of the media. The event is part of an annual NATO maritime exercise in the Baltic Sea called BALTOPS, running from June 1 to 16. The exercise dates to 1972. But with Russia’s 2014 invasion of Ukraine, and heightened tensions across Eastern Europe between NATO and Russia, the exercise is now more than just a chance for NATO forces to practice operating together in the high-stress environment of simulated combat. Today, BALTOPS is a signal to NATO’s eastern members that the alliance is committed to their defense. It’s also a message of deterrence to Moscow, underscoring that military aggression against a NATO member could lead to war. The NATO formation comes together while it orbits on a refueling track over the Baltic Sea within international airspace. Then, unannounced, a Russian Su-27 Flanker fighter merges to intercept the NATO aircraft. 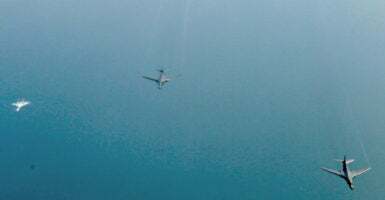 Out of the rear refueling boom operators station, with a window facing down and behind the aircraft, this correspondent observes as the Russian fighter jet, painted in light blue camouflage, approaches. The Russian fighter moves in from the front right side, merging to intercept within a few hundred meters laterally and at the same altitude as two U.S. Air Force B-1B bombers—approximately what the Air Force calls tactical formation. 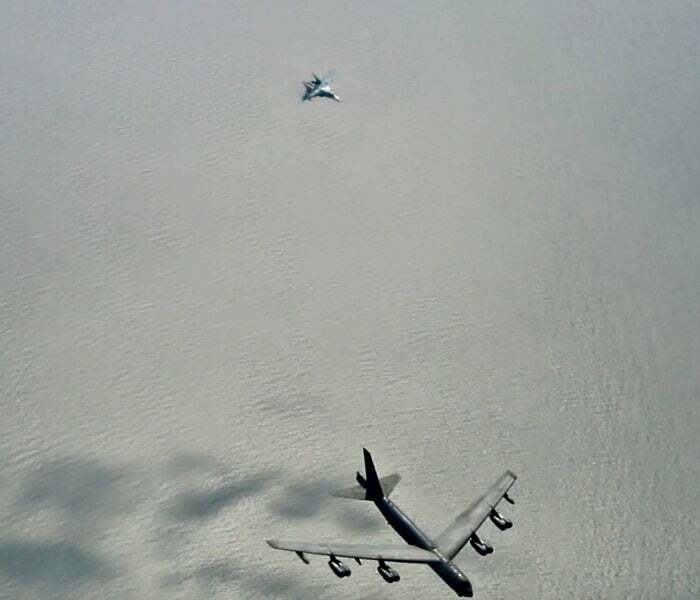 The Russian warplane cuts laterally across the formation from right to left, briefly trailing a U.S. B-52 bomber. The NATO formation does not modify due to its unanticipated presence. After a few minutes, the Russian Su-27 breaks off and the formation continues as planned. U.S. pilots and their commanders downplay the Russian intercept, underscoring that it was not provocative and that U.S. and NATO aircraft never were in danger. In an email to The Daily Signal, a U.S. military spokesman confirms the Su-27 had its transponder switched on, so the aircraft could be identified. 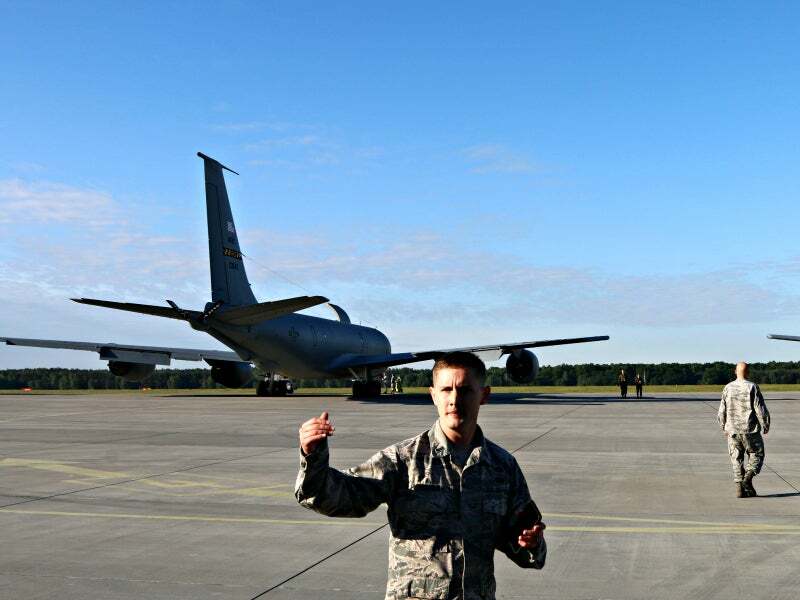 “We were flying with our allies in the Baltic Sea and we were intercepted by Russian fighters as expected,” writes Lt. James Fisher, an Air Force public affairs officer who was on the KC-135 flight to observe the Russian intercept. Still, the sight of a Russian fighter jet merging alongside a pair of B-1B bombers and then cutting across the tail of a B-52 bomber is extraordinary, underscoring the new normal of NATO-Russian military encounters in the region. The Western alliance is engaged in a delicate, peacetime back and forth with Russia, in which both sides are prone to see routine military operations and exercises by the other camp as provocative acts of brinkmanship, or regional power plays. “We were flying with our allies in the Baltic Sea and we were intercepted by Russian fighters as expected,” says Air Force Lt. James Fisher, here at Powidz Air Base, Poland. Russia’s air activities over the Baltic Sea have been more aggressive since 2014, the year it invaded Crimea and launched a proxy war in eastern Ukraine. Resultantly, NATO has stepped up its air policing mission in the region, doubling the number of warplanes tagged to patrol the Baltic skies from four to eight in 2014. “In 2014 and 2015, the number of NATO Air Policing flights over the Baltic and Black Sea areas increased significantly due to increased Russian air activities,” according to the 2016 NATO Secretary General’s Annual Report. Russian warplanes now routinely intercept NATO warplanes and ships in the Baltic Sea. U.S Air Force personnel say that as long as Russian jets abide by international norms of air safety, they are free to do what they want within international airspace. Russian state media and U.S. Air Force personnel portrayed the June 9 intercept in sharply contrasting ways. Kremlin officials and Russian state-controlled media painted the intercept as an instance of Russia’s standing up to NATO aggression. “The fact that NATO forces are converging near Russia’s borders and carrying out military exercises supported by strategic bombers from the USA capable of carrying nuclear weapons hardly helps de-escalate tensions in Europe,” Russian Foreign Ministry official Mikhail Ulyanov said, according to Sputnik, a Russian news agency. For their part, U.S. pilots dismiss this intercept as a normal part of flying in international airspace. “We’re professional fighter pilots; that’s not something that would be a distraction, or would require any focus to prep. That’s kind of normal ops for us,” Lt. Col. Benjamin Freeborn, commander of the 510th Fighter Squadron, says. The 510th is an F-16 squadron based in Aviano, Italy, which deployed here to Krzesiny Air Base, Poland, to support BALTOPS and Saber Strike, a concurrent NATO exercise in the region. “Everything we’ve seen in the exercise so far has been safe and professional,” Freeborn says. 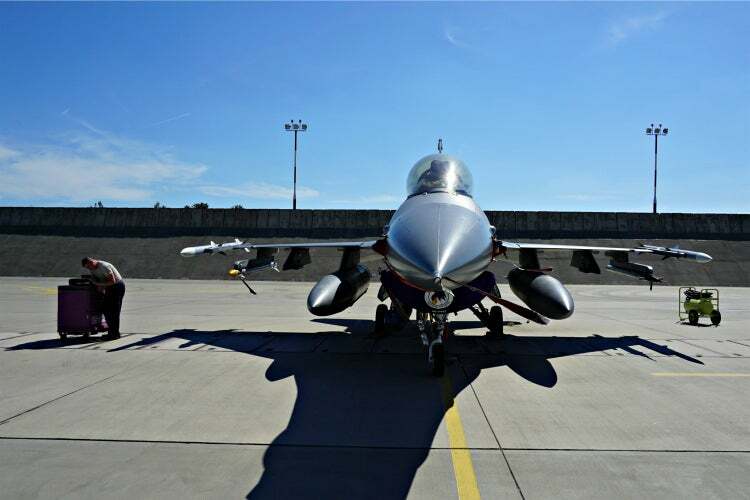 A U.S. Air Force F-16, from the 510th Fighter Squadron, on the ramp at Krzesiny Air Base, Poland. BALTOPS is an annual multinational, maritime-focused exercise. This year, 14 countries participate. The exercise involves 4,000 shipboard personnel, 50 ships and submarines, and more than 50 aircraft. Like other military exercises in Eastern Europe involving NATO and its partners, the simulated enemy forces confronted by NATO in BALTOPS are not specifically labeled as Russian. The simulated enemy aircraft, called aggressors, are considered to be near-peers—a hypothetical military adversary with technology and training on par with the U.S. and its allies. The BALTOPS aggressors are, for the most part, simulating Russian military aircraft. “It’s not focused in any cardinal direction or against any specific adversary,” Freeborn, the F-16 squadron commander, says. The U.S. has no permanent Air Force bases in Poland. Yet, different units rotate throughout the country in a noncontinuous cycle, and U.S. pilots are embedded within the Polish Air Force as instructors and advisers. Detachment 1, from the 52nd Operations Group, which is commanded from Spangdahlem Air Base, Germany, is the first U.S. permanent operational military unit in Poland. Beginning in 2012, the detachment supports four annual U.S. aircraft rotations into Poland, two each of F-16 fighters and C-130 Hercules planes. Most U.S. pilots are too narrowly focused on their day-to-day mission to gauge the overall effect of their presence on how allies feel about U.S. security guarantees–or on deterring Russia. Yet, at the back of their minds is the realization that every mission flown is not just about learning or perfecting a combat skill. Every sortie is also a diplomatic statement. “Success for me is our unit getting to exercise our multirole airpower that we train to with our NATO partners, and hopefully that contributes to some sort of long-term stability, independence, and prosperity in the region,” Freeborn says. “We’re ambassadors of our nation,” says Staff Sgt. 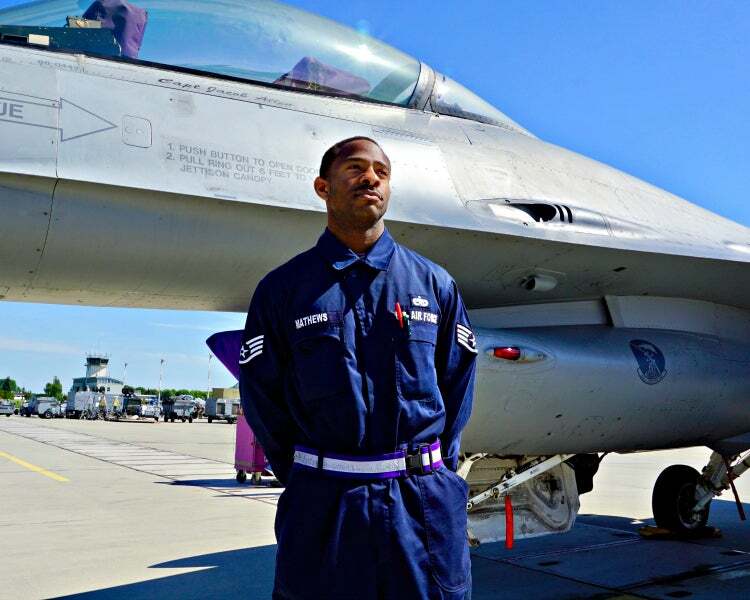 Marcus Mathews, an F-16 crew chief with the 510th Fighter Squadron. There is another, deeper, layer to exercises such as BALTOPS, and it involves more than just ironing out logistics or developing common tactics. A level of human-to-human trust develops when working side by side with other countries’ militaries in the high-stress environment of simulated combat. “We’re ambassadors of our nation,” Mathews says. Mathews is from Killeen, Texas. He speaks in a measured clip and says “sir” a lot when talking to this correspondent. Walking among the 510th Squadron’s F-16 fighters lined up on the Polish ramp, he is upbeat and full of pride about his job. Much of the media attention in an exercise such as BALTOPS focuses on the aircraft and the pilots—especially with B-1B and B-52 bombers in the mix. However, some of the most important lessons learned, and the hardest work done, happens on the steaming hot tarmac of airfield ramps such as here at Krzesiny Air Base. That’s where Mathews and other crew chiefs work day and night to keep jets flying. 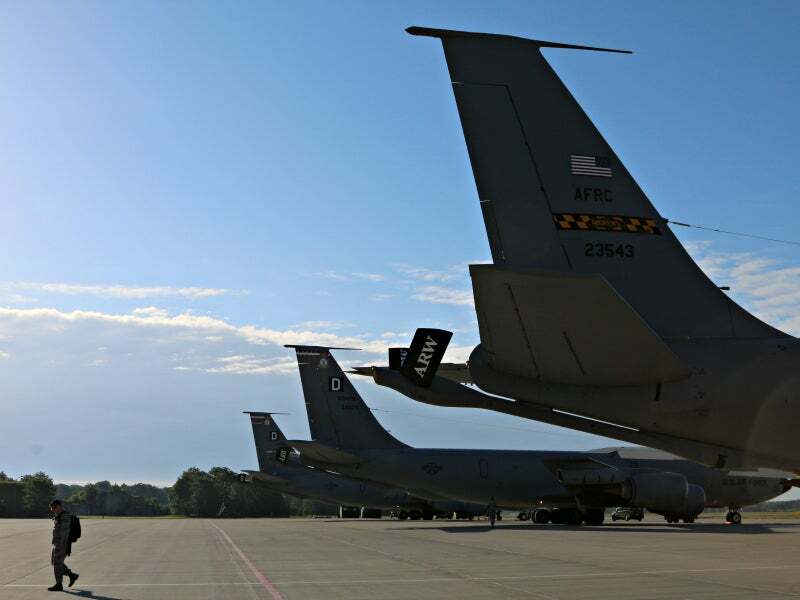 Transplanting the squadron’s maintenance infrastructure from Aviano Air Base in Italy up to Poland requires maintainers like Mathews to start from scratch in many ways. Even the simplest things—where to get fuel, where to throw out the trash—can be headaches at an unfamiliar base. Then there’s the language barrier with Polish counterparts. Those minutiae of day-to-day operations are some of the biggest hurdles to sort out in peacetime exercises. Deploying to an unfamiliar airfield is a challenge for pilots, too. Freeborn says that flying daily simulated combat operations out of a new base, with unfamiliar airspace and local procedures, takes pilots out of their comfort zones and better simulates the real world complications that come from rapidly deploying away from home station to respond to a crisis. “They have to adapt their normal habit patterns to an unfamiliar setting,” Freeborn says. U.S. Air Force KC-135 aerial refueling tankers lined up on the ramp at Powidz Air Base, Poland, as part of NATO’s BALTOPS exercise. BALTOPS is a peacetime military exercise occurring above the actual location where a conflict could break out. It comprises frequent aerial run-ins with NATO’s most likely adversary, Russia. It’s not an exercise held over a desolate desert range in Nevada, or a swath of empty terrain in Alaska. NATO forces are not simulating, in some distant place, the battlefield over which they could fight the next air war. They’re at it. And the enemy is watching their every move. As a result, this exercise is more than a chance to rehearse combat operations. It’s also a dry run of the logistics operation necessary to move U.S. military assets to the Baltic region. “Even the simple things are difficult,” Freeborn, the F-16 commander, says. Another novelty of the exercise for the Air Force is the battlespace. Air Force pilots typically spend less time training to operate in the maritime environment than their Navy counterparts. Yet, as part of NATO’s air policing responsibilities in the Baltics and the Arctic to counter the Russian threat, many Air Force missions occur over the water. BALTOPS is a chance to hone skills supporting maritime operations, which only can be simulated at other Air Force training sites. At least for us in the 510th, that’s an absolutely unique experience for us to actually get to physically work with the naval component of our joint team. Certainly working with the physical assets and not having to simulate something is great. Both with the Army, the Marines, the Navy … those are just usually fake voices on the radio. The U.S. trains to go to war with its allies. Poland, a former Warsaw Pact member state, joined NATO in 1999. Today, the U.S. F-16 pilots hold their Polish counterparts in high regard for the rapid transition they’ve made from a post-Soviet military into a valuable NATO asset. On the ramp here at Krzesiny Air Base, Soviet-era Russian fighter jets that the Polish Air Force operated as part of the Warsaw Pact are lined up beside a U.S.-made F-16 fighter—the Polish Air Force’s modern workhorse, which it began flying in 2006. Every so often, on this day, U.S. and Polish F-16s roar overhead. On the ramp beside the old Russian fighter jets, Padilla, a seasoned American fighter pilot for whom jet noise is a humdrum part of his workday routine, can’t help but look up.